Being neighbour to the multi-year restoration of Province House means we have a unique opportunity to see the job site evolve over time. With the transition from Phase 1, Erect the Exoskeleton to Phase 2, Fix the Structure, one contractor has given way to another, and so new temporary buildings and signage have gone up. To escape the summer heat indoors last night I went for a bike ride and, a Receiver Coffee iced tea in hand, I stopped on the park bench in front of 180 Richmond and sketched some of the new arrivals. 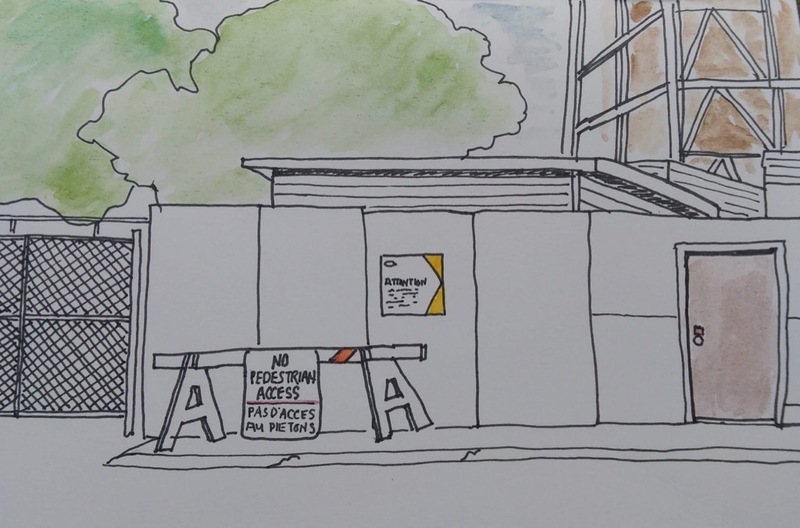 I’m proud of how close I came to getting the tricky angles of the “no pedestrian access” barrier down; less proud of the mess I made of the small part of the exoskeleton in the background. My favourite part is the orange swath. Written July 25, 2018 at 12:14 p.m.